Did you know that Doodlebug's offices were featured in the new Creative Spaces Volume 2 special issue from Creating Keepsakes that was just released this week? This is the first time your favorite companies have been featured in a Creative Spaces and you will not be disappointed in what is included in this beautiful idea book. To purchase a copy of this issue, simply click here. To celebrate, we thought we'd giveaway a copy of the Creative Spaces Volume 2 issue to our followers. All you need to do is leave us a comment here on the blog letting us know what your favorite part of your craft room is and why. We'll announce the winner next Tuesday, Jan. 15th here on the blog. And if you'd like to see other inspiring ideas for your craft space, but sure to following CK's Creative Spaces Pin board on Pinterest. Here's a sneak peek of Volume 2. And don't forget about the first issue. This issue was one of the most inspiring idea books to hit the news stands in ages. It inspired our own Lori Allred, to finish her craft space and she is featured in this issue as well. It's also available for purchase by simply clicking here. I love the window desk that my husband built me. He is so not into wood working, yet he did this for me! My favorite part is the countertop height, padded, swivel stool my husband bought me for my craft room. So comfy, with a back for support and it turns wherever I need to go! Love it! Oh that's easy...my Doodlebug Collection!!!! My favorite part of my craft room is my glass-top table- it's so easy to clean! My favorite part of my craft room is my L-shaped desk! LOVE it! I have a large cabinet with sliding glass doors, in it I keep my supplies in clear plastic open top boxes. Everything is visible, accessible, and dust free! Love this! :) My favorite part of my scrapbook room is the wall color - it's Doodlebug's Swimming Pool! :) Love how energized, happy and creative it makes me!! It's my two white 5 shelf bookcases. They are clean, and crisp looking, and keeps things organized, and looking oh so pretty with their pink/white polka dot baskets adorning every shelf. I can easily access my collections, stamps, inks, etc...Love doodlebug in every season, every year. Great designs. My favorite part is my counter-height table. I love standing to scrap, and it is perfect! Sadly I do not yet have an official craft room...but I am in the process of moving and have a large unfinished room in the new house that is all mine! It is kind of like an attic room, so the ceiling is triangular and I am so excited that it is unfinished and I get to make it anything and everything I want it to be! My favorite part is the little decorative touches - like the antique bowl holding buttons and the art projects from my daughter. I just like being surrounded by pretty things when I create. Favorite part of my craft space--the little floating shelf on the wall right above where I sit. What I have on it are things that make me smile--a fun quote, pics of my family, a small plaque w/my life Bible verse, some pretty ribbon in jars and a funny card a friend gave me about a year ago. Love to stand and scrap, so my counter height work space is my favorite! With under the counter storage for my cutter and mats makes it super easy to access. well, aside from my actual 6 x 4 ft craft table, I love my spray station complete with air compressor! Congrats on making the issue! I can't wait to see it! My favorite part of my craft room is actually the story behind it! I bartered with my neighbors (they needed a dog/house sitter, and I needed a craft room!) They built me a custom craft room, from the ground up, complete with new flooring, lighting, a 14 linear foot desk and paper shelves with 75 slots for paper! And my cost? $22 out of pocket and some dog sitting! My favorite part about my craft room is that it is off in a hidden corner of the basement and doesn't need to stay clean when I go on a crafting spree! My favorite place is my work table where I bring all my supplies to and end up with a 1' x 1' space to work, lol. It's a big enough table but somehow it all closes in on me once I start working. I'm sure everyone knows what I'm talking about. Oh how I would love to have a copy of this magazine. We're moving into our new home at the end of the month and I will finally have my own craft room. No more dining room corner scrapping for me! In any case, while I'm super excited about my new space and cannot wait to get it furnished and decorated, I have no idea where to begin and would love some help with ideas! I love my BIG oak table that I can spread out all my creating stuff on and not have to clean it up until I'm ready to! My favorite part of my craft table is the banquet table I use as a desk, cause it's big enough to store all my stuff and for a friend to scrap at the other end! My favourite part is the fact that everywhere I look there are little things I made - altered storage, a cushion on my reading armchair coordinated with the curtains I made, the chair I recovered and the pinboard I altered. It makes the room feel very "me". My favorite part of my scrapbook room is the handmade and painted stamp shelves me and my kids built for my b-day present while my husband was deployed. they are not straight by any means but they are perfect!!! I do not have a craft room. Mine is tucked into clear bins in my bedroom. I scrap on my coffee table which I love. My favorite part of my craft room is the closet. It's a walk in closet with shelves lining 3 walls. I have everything organized in there and it's very nice to sit at my desk, pick out photos to scrap, then go gather the supplies from the closet. My favourite part is on the wall where hubby put the metal bars from Ikea to hang all my punches on so I can see them all at a glance. i love my space! although i wish i was a little more organized. i heart doodlebug! My favorite part is the antique shelf I use to display my favorite stamps. I remember my Grandmother every time I see it. My favorite part of my art room is the wall. I love the cafe rod that holds 4 layouts at a time. It enables me to look up at any time at my family. Hard to pick just one thing I like! Mmmm, I really love my whole scrap space. It desperately needs reorganizing tho! I love my shelves, table space, painted walls, decor, supplies . . .
Congrats on your feature in the magazine! My favorite part of my craft room is that each craft has it's own space. Paints over here, sewing machine over there, scrapbooking paper in that corner......and everywhere else! I LOVE having my own craft room!! I love the fact that my scrap space is FINALLY being built!!! My heart is drawn to the paint storage area. The cubbies look so festive and fresh with the bottles organized by color. I am drawn to color and this splash of freshness is happy looking. It is like springtime all the time! My favorite part of my craft room is the room for multi media projects. I make cards, do scrapbooking, stamping, paint, sew and make jewelry. I use many of the same tools for all projects. Whew! My island table is my favorite part of my scrap room. It is counter height and has storage underneath. Love it! My favorite part of my scrapbooking space is an old child's cabinet that we "rescued" that has glass doors that reveal two shelves inside that showcase some of my wooden block stamps. It also has drawer and two more shelves that open up to reveal more stamping, embossing, and coloring supplies. My large white desk is my favorite part - it has shelves and drawers to hold lots of stuff and a large work area. Just wanted to pop in and say it is sooo worth the money.. please if you do pick my name choose another I already have one coming! I tend to work on my dining room table but my favorite part is that it is all about the POSSIBILITIES! My favorite part is my Ikea shelving unit that holds all of my 15" deep scrapbooks and so many supplies! My favorite part is that I have a craft room! I used to haul everything out to the kitchen table, then have to put it away! Now if I'm working on something it can stay out! The one thing that I love most about my space is that it IS MY SPACE! That's the best part!!! I am in the process of creating my Craft room and haven't decided the best thing yet, but I love the ideas I'm getting from your site. My craft room has a long ways to go, but I love my new cube organizers I bought after Christmas, I got lots of stuff out of tubs and into drawers and jars. I also love the big wide touch screen pc I got for Christmas, since most of my crafting begins digitally! My favorite part of our scrap room, is that it's OUR scrap room... a place for my Mother, myself, my Daughter, and my Son to all sit and create memories together... It's a beautiful thing, when there's time for all of us to go in and maintain the traditions of keeping our photos and memories together in albums where we can all go back and reminisce and smile and laugh together! My favorite part of my scrapbook room is my doodlebug furniture. I have the cubes that shelve all my cardstock and it is organized by the rainbow colors and it makes everyone happy when they are over scrapping. So Cheerful! My favorite part of my scraproom is all the little details that make it special to me. The little owl valance that hangs above my window, the pretty little odds and ends I've collected over the years, all my favorite scrapbook items organized and easily accessible, and all the wonderful cards and items friends have gifted me with. My scraproom makes me smile as soon as I walk in and that is pretty awesome! I like how I have my paper organized. I had an old sewing table from my Grandmother which looked very tough and beat up. I no longer had the sewing machine, but the table was the perfect size for my Cricut so I cleaned out the inside, sanded down the legs and top, painted the base and legs black, refinished the wood top, and put an old cabinet handle on the drawer. Now, I have a piece of furniture that I refurbished and reminds me of my grandma whenever I cut something out on my Cricut! I craft in my living room. I have the end with the BIG picture window! I LOVE to watch the birds while I create! Thanks for more sneaky peeks! My favorite part is probably my chair. It's comfy and sits me in the perfect spot to look out the window. That, or all the counter space I have to spread out! I love my glass L desk - lots of room to spread out, and easy to clean! Wow - just gorgeous! My favorite part of my room is my paper bins. They make me happy! My favorite part of my craft room is a section of the closet. I had some adjustable shelves built in there. My favorite part of my craft room is my work area! I have two big work islands (like you would put in a dining room against a wall). I bought two of them and put them back to back. This way it is twice the size. I also have storage drawers and cabinets underneath and rods on each end for hanging ribbons and such. Great work area! Thank you for a chance to win! My favorite space is the antique buffet with plenty of room for storage. But the rest of the room - it needs help! I like that I have a space. I've just set up an old office space but have yet to scrapbook in it. I love that i have a table for my Silhouette. My space...is just that..my space. A studio atmosphere where all my stuff is within easy reach. Extended areas for storage making easy access to everything else I need. I'm always looking for better storage solutions and being able to work more efficiently. My chair, so comfy, swivels easily from the computer to the small table I work at most often...and when everything is clean, tidy and organized...I'm my most creative!! My bookshelf. It's where I store everything and it helps me stay organized so I can find stuff! That fact that it is my room. It's a mess. But it's my mess. My favorite part of my craft room are the black shutters on the wall where I put things that inspire me. I love this Creative Spaces idea book! I bet the second one is great too! I work at my craft desk, which is situated in our dining room. Lots of activity happens in our kitchen/dining room and I did not want to miss out on the action. It is the perfect fit for our family. LOVE that Doodlebug is in there. I'll be scouring stores looking for a copy. Look at that close-up photo of all that Doodlebug cuteness. I spy some cute paper posies and buttons! I love my desk! It's long but not too deep. I spent alot of time looking for it as my craft cave is a tiny converted 3rd bedroom. It also shares space with our treadmill. Thanks for the chance to win! My favorite part is my extra desk...But only when my best buddy drives the hour and 45 minutes to me. Lacking her, it would be black bookcases because they are filled with a rainbow of papers,buttons,bling, stickers,and my organization books. The favorite part of my craft space is the closet that I have dedicated to my craft supplies. I have 2 drawers trolleys in there where I keep all my stamps and tools. My favourite part is that it is in the kitchen, so I can get crafty and still be a part of the family activities (and be close to snacks)!!! I was thinking of getting this book so to win it would be even better! The best part about my craft room is that I moved it from the upstairs second bedroom to the downstairs living room so I could have more room. Boy was that a lot of work! When I really get going, I can also use my kitchen island for my Cricut. 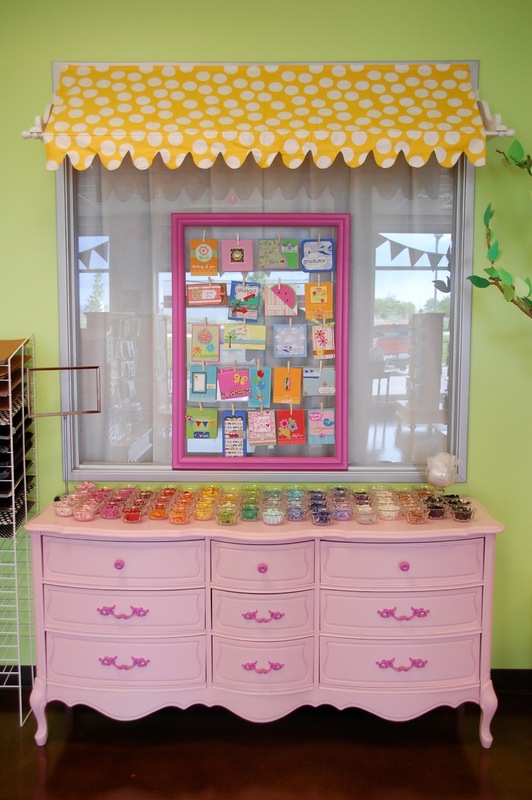 My favorite part of my craft room is the cabinets I had made with the pull out drawers! I used to keep paint in them, on it's side, but painting gave way to scrapbooking/card making so now I have stamps, paper and large embellishments in them! It's great for seeing what i have! my favorite part of my room is my ribbon shelf - I have clear containers that stack on top of each other, I have separated the colours and it looks colourful and I can find what ever I need right away! My craft space is half of my dining room. My favorite part of it is my desk, it's huge(I have about 16 feet of work surface just in length, it's about 2 1/2 feet deep too). Of course, it's usually messy, but when it's all organized, it's a great space. I'm actually re-vamping my organization this week, so it's should all be back to order soon. My favorite part of my craft room is my supply stash, especially my happy and fun Doodlebug goodies! My favorite space in my scrapping area is that my scrapping places are two doors, one is standing height and one is seated height. Right now I'm using the seated table more often, but I go between the two. Another choice would be the Ott Lights that I move from table to table, sometimes they are my favorites. My craft space is vey big but aslo very dark so I like the fakt I have lots of lights annd can not forget about all those space I have for all my papers ! My favorite part of my craftroom in the desk. It is a big l shape with lots of storage. My favorite part of my craft space is that it's in my dining room so I'm close to my family while I'm crafting! My favorite part of my craft room is my table where I have my cricut, cuttlebug, and all the accessories. It's were all the magic begins! I would love to see this issue! I love my large white L-shaped desk that I just got for my scraproom. I would love to win this publication! Thanks for the chance. I love my little lamp .. It makes the space feel soft and I feel comforted while there doing my craft-art. I like my bookshelves with stamps on them. Love my desk. Bar height so I can sit or stand comfortably! First, I love that I have a craft room! Second, I love the table space I have to spread out and work! Thanks for the chance to win! I love my solid walnut desk and the large windows that allow a lot sunshine in. My hubby designed & built me a great craft/sewing room last year. My favorite thing is that when I open the closet door he made it so the light would go on! My favourite part of my craft room is the table that I craft on. It is the first kitchen table my husband and I bought right after we got married! I love my cabinets where I can store all my goodies. Love my apothecary jars too. one of my favorite things about my craft room are my clear glass jars that hold my buttons, my flowers, and my ribbon scraps. They show off the bright colors and are so much fun to look at. I have just acquired 4 beautiful wooden CD Towers that I am using to store all my dies and other assorted goodies. They are stacked 2x2 so no wasted space! Best part, they were free! OHHH! I would love to win this mag--I'm always inspired by crafty spaces!! My 2 bookcases. Over time I have found assorted baskets and glass jars for all the embellishments, ribbon, washi tape and Doodlebug buttons that I could never find when I needed them. my favorite is the very skinny shelf i put up on one wall that has most of my wood stamps and martha punches. this way I can view most of what i have and I am not searching for them. Oh, I wish I had a craft room. I've just taken over the dining room. I love my paper storage area. Someday, I can pull all my storage units together and really get organized. i have just recently moved my craft room upstairs! i LOVE all the natural light; the room is painted a very inspritational bright green and pink which makes me happy and want to creat MORE! i love all my big storge cupboards but mostly i LOVE LOVE LOVE my old wooden desk given to my by a good friend! come by for a crafty day soon!!! I have a corner of a room for my craft stuff and i love my baskets...keep things within reach and organized. Congrats. I love my desk...lots of space to work when I can keep it clear and clean! I ❤ my doodlebug small wall shelf! It displays all of my crafts that I make! I love the walk in closet that is in my scrap room. It holds all of my paper organizer cubes and "hides" the clutter and the growing stash of scrap supplies! My pegboard because I have very limited space so I use the vertical space to organize some tools and embellishments on it! My favorite part of my craftroom is the 6' kitchen counter desk and the cadet blue walls. One of my favorite parts of my craft room is the shoe organizer hanging on the back of my door for my adhesives and less used items like my brayer. I love it because it is handy and uses space I wouldn't have used otherwise. Space is a premium in the room. My dh and I share the space, which isn't much to begin with! My favorite is the 3 bookshelves that I have to store my supplies and books on. My fave thing about my scraproom is my desk, for Christmas about 4 years ago my Father in law built it for me. It really does make me feel special that he took the time to build me somthing he knew I would love. Wow very cool! My favorite part of my craft room is my paper storage. I love seeing it all lined up! LOVE the beautiful buttons in the pic.....my favorite thing about my craft space is the crafting table the my hubby built for me a couple of years ago.....LOVE IT!! The fave part of my craft room is my organization system for my ribbon spools--antigue wooden bobbins. So cool AND pretty. Thanks for the chance to win! My favorite part of my craft room is the windows. I am lucky to get lots of natural light and it just makes me happy to spend time in that room! my favorite part is my desk-it is nice and big! My favorite part is the wrought iron rack that holds tons of idea books, tools and all my cardstock and patterned paper. I love all the color--the little containers, jars, pens, etc! I have a big table that I scrap on and a shelving unit that holds my inks and stickles. I love that they are so accessible! I love that my craft room is mine! I don't have to share this space with anyone else! I haven't had my own room since I moved out of my parents house 23 years ago! I love that I can decorate it any way I want an I have no one to answer to. I love the big window I have by my desk. I can see the garden, see the rain or the birds while I craft! My yard sale score of 2011 - an upcycled armoire turned into a craft storage cabinet! Would love to win Issue 2. My Favorite part of my craft room is the door. Yup. I can close it and shut out the rest of the world so that I can craft craft craft! So get this... my craft room is paint SWIMMING POOL BLUE! I love that, but one of my favorite things is the Doodlebug scalloped shelf that you see hanging right when you come in the door. I rotate out memorabilia that I find inspiring and it just makes me smile each time I walk in. Right now my sticker storage is my favorite thing! I just recently redid it and the new system works SO well and looks super cute, too!!! What I love about my scrapbook room are my shelving units which are way too full right now LOL!! NEED TO PURGE!!! I love my craft table. It's large, solid, and takes oh so much of my abuse. my craft space is still evolving. trying tofind just the right bins to hold all of my stuff.. i love to see new ideas! would love to win this magazine!!! I would love to have this magazine! I love my desk that my hubby built for me. He made the drawers in it very shallow so that stamps sit in it without the waste that would happen in deeper drawers. He also made narrow pull out shelves to hold my solid card stock.